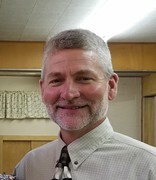 Scott Cernek became pastor of Peace Church in June of 2018. Scott grew up the 6th of 8 children in a farming family in Northwest Indiana. His folks were Indiana dairy farmers who loved the Lord and helped to start the Liberty Bible Church near the town of Chesterton in the 1950s. They moved to Wisconsin and were able to purchase their own dairy farm in Lafayette County near South Wayne in 1972. They helped to start another small Bible church in the village of Gratiot in 1976. Scott graduated in 1980 from Black Hawk High School in South Wayne and went on to the Moody Bible Institute in Chicago before transferring to UW Platteville where he graduated with a degree in Physical Education and Health. In 1986, the former Cathy Schliem and he were married in Monroe, Wisconsin. In 1990, they moved to Clinton where Scott began to teach and coach in the school system, and they raised a family. In 1996, several families in the Clinton community came together to begin a Bible church in the village. While taking courses through Trinity Evangelical Divinity School, Scott became bi-vocational pastor of the church in 1997 and continued in that position until 2017. They then relocated back to the Gratiot area. "Cathy and I have four grown children and six grandchildren as of July 2018. We are blessed and honored to serve at Peace Church here in Browntown."